Side Arms Hyper Dyne enemy comments. The PC Engine CD version of this shmup by Capcom has an enemy slideshow when you beat the special mode and it's only found in this game. Does anyone mind translating the short text and name each enemy has? It probably has some hilarious descriptions. All purpose mobile suit that is used everywhere. Underwater mobile suit model. Attacks enemies with rocket punches. Bipedal mecha. Can climb vertical/perpendicular walls. Covered with the thick metal alloy Capcom-Z. Beware of sudden punches when it turns around. Suddenly appears by using a material teleporting device. Stops intruders in their tracks by creating a gravity field. Prevents intruders from passing through. Homing missiles installed in the ceiling. Fighter capable of moving at high speed. It doesn't have much battle power, but it does have power units. With very good mobility, this VTOL fighter is heavily utilized. Protozoan creature that lives in an abundant area of the world. If you come into it's territory, it will attack you. Artificial mecha made using the battle power of a Heat Worm as a base. With plenty of battle spirit, it will self destruct if you do not attack it. Cannon that shoots homing missiles. A modified Slayer that can also be placed horizontally. Can shoot three bullets at once. An anti-aircraft cannon that can shoot continuous bullets. Re: Side Arms Hyper Dine enemy comments. Hopefully someone will do the comments too. All of the speeds say "Mach (#)", and the ones without stats just say "cannon". Beware, as it shoots rocket punches behind it's back. Fighter capable of moving at light speed. Main force fighter that was once an emergency vehicle. A clever cannon that can shoot continuous bullets. As for the first enemy, Zaku, the sprite is different from the Gundam desgin but the description is pretty much the same, i.e. "A general purpose MS". 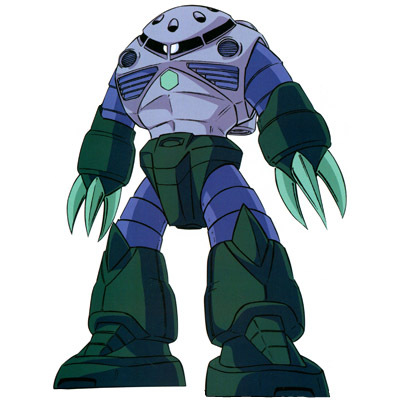 In Gundam, Zaku are the basic Zeon MS that the protagonist has to fight against (or that the protagonist uses in rare cases). ～ざま usually means "as soon as", so I'd say it's more like "beware of sudden punches when it turns around" or something. "Suddenly appears by using a 'material teleporting device (物質転送装置)'" (maybe "materializer" or something). That's its main ability it seems, anyway. Could also just be "at high speed" (高速). "Emergency vehicle that once constituted the main force". かつて modifies 主力戦闘機. I think that's 高射砲台, "anti-aircraft cannon". I knew there'd be mistakes, being all hiragana. Thanks! I modified the first post with all the translations. Thanks Garoth, DS and LostTemplar for the help. Can any of you double check the names and descriptions once more to see if anything else can be refined? Special those names that are still undecided. DarknessSavior, where did you get those descriptions? The Japanese text doesn't seem to match the ones in the game. Did you go through the trouble of writing it down? I just went through and typed it up in hiragana and kanji for my own convenience, converting the words I was sure were correct into kanji as I went. Reading it as katakana is a giant pain in the arse. That's why some words are still in hiragana; I wasn't sure what they were as I typed them down and had to look them up later. You should probably go with Comanche. It's an Indian tribe. The reason why I think may be the correct translation is because of Mohican and Apache also being enemy names based on Indian tribes. Tenjou is Heaven or ceiling. See for yourself. I think in reality, this should actually be Ceiling Missile. Here is some usage. It's a bit weird. Without kanji, this name is horribly vague. It feels like a cop-out leaving it as Tenjou Missile. This one still makes no sense to me, but the best romanization I've found has been Grover. If you look the kana up, you'll get some things (and the link I provided, in Japanese) such as the Sesame Street character and an artist. In English you still get the Sesame Street character, but also, a different number of artists. So yeah. It could just be a reference to Grover's Algorithm. I feel stupid. This is Falcon Metal. Actually, this one could be Scray. As in "a sea swallow or tern"
This one is still weird. I get nothing on Google.jp. It could be Nike 3rd (as in, this is the third model Nike). Could be a reference to the goddess of victory. Re: Side Arms Hyper Dyne enemy comments. A roundish thing with gravitational powers? I thought about that too, but I kept thinking it was odd. It could be Glober. And when you put it that way, it makes sense. At least, more than any other theory, really. Alrighty, thanks for the additions.